By Rowans Ltd. of Buchanan St. Glasgow and New St. Birmingham. Size 67/8, physically measuring approximately 55cm. 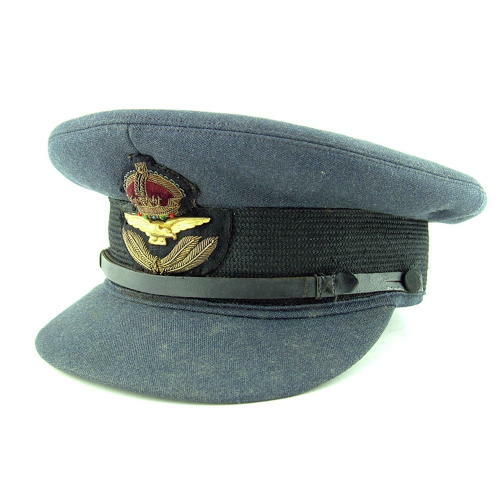 Early pattern peaked cap with green leather underpeak. The cloth is in very good condition apart from two tiny (1.5mm) moth nips on the crown and light soiling on the peak. Leather underpeak very good bar light marking. Excellent mohair band with good bullion badge (note some material loss on left side). Good leather strap. Tan satin lining with printed manufacturer's details. Good inner leather band. A very nice early cap. Advert copied from the Tatler, October 1942. Stock code U22046.